Upserve Loyalty takes the hassle and guess work out of your loyalty program. The Loyalty Program leverages your customer’s credit cards as their loyalty card, making it easy to earn points, and even easier for you to gather data about your loyalty members in the Upserve HQ Guestbook. Market to each loyalty customer at an individual level and learn what turns guests into regulars to keep them coming back while driving more revenue from your regulars. For Guests – Guests love restaurants using Upserve Loyalty because once they sign up, they don’t have to remember to bring the designated loyalty card; they just use the card already in their wallet! Everything is tracked via a custom loyalty page for the restaurant and credits are automatically applied so the customer doesn’t have to remember to claim their rewards. For Owners, Operators and GMs – Create a program that helps drive business, maintain relationships and motivates guest behvaior with tailored rewards. 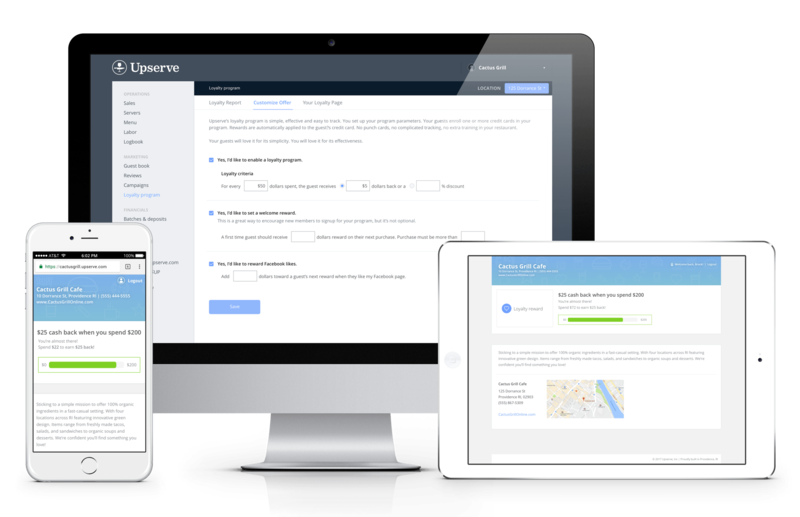 Upserve Loyalty lets you understand customers through the integrated CRM solution within Upserve HQ’s reporting platform to help make better marketing and management decisions. Take the guesswork out of understanding loyal customers by being able to confidently answer questions like: Do discount programs drive business? Do my loyal customers spend more with me? Am I attracting the right type of guest to drive my average ticket higher? For Servers – Servers love Upserve Loyalty because they don’t have to change any behavior to apply the rewards or worry discounting checks or losing out on potential tops since Upserve applies the reward behind the scenes. Integrated directly into Upserve Payments customers on the Pro package, Upserve Loyalty uses customer credit cards to enable reward credits to be applied back to the customer. No messing with discounts, taking money off the check, or impacting potential server tips. Upserve Loyalty is as simple as setting up in the Upserve HQ portal and suggesting guests sign up!